Learn all the essentials for making your first year of teaching a success! 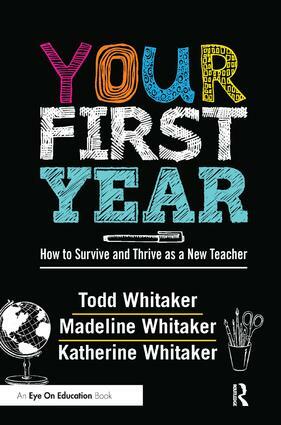 In this exciting new book, internationally renowned educator Todd Whitaker teams up with his daughters--Madeline, an elementary teacher, and Katherine, a secondary teacher--to share advice and inspiration. They offer step-by-step guidance to thriving in your new role and overcoming the challenges that many new teachers face. Topics include: Learning classroom management skills such as building relationships and maintaining high expectations and consistency Setting up your classroom and establishing procedures and rules Planning effective lessons and making your instructional time an engaging experience Managing your own emotions in the classroom and dealing effectively with misbehavior Working with peers, administrators, and parents to build support and foster collaboration The book is filled with specific examples and vignettes from elementary, middle, and high school classes, so you�ll gain helpful strategies no matter what grade level and subject area you teach. You�ll also find out how to make tweaks or hit the "reset" button when something isn�t going as planned. Things may not always go perfectly your first year, but the practical advice in this book will help you stay motivated on the path to success! Bonus: As you read the book, get even more out of it by discussing it with others. Free study guides for practicing teachers and student teachers are available as eResource downloads from our website (www.routledge.com/products/9781138126152).